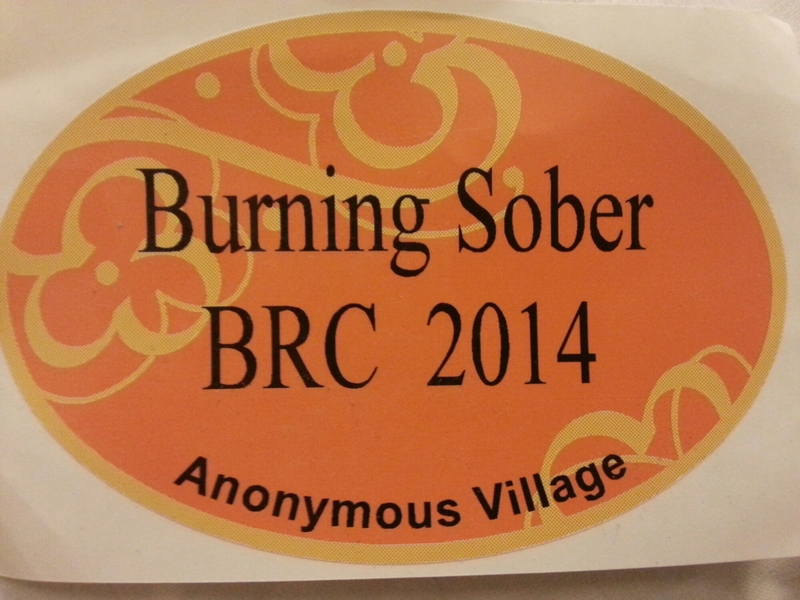 So it would seem that Burning Man would be a nightmare for a recovering alcoholic. I am not sure if I would have been ready to try Burning Man sober if this was my first year going. Also, I am not sure I would have gone if I was less than 90 days sober. I felt having already experienced the temporary city for many years, plus 7 months sobriety, helped me handle the onslaught of free alcohol. I knew what to expect. I knew I would not be overwhelmed by the festival as a newbie, or virgin, would be. I knew there is a lot more to the city than partying and drinking. I also knew there were specific camps for alcoholics. The weeks leading up to Burning Man, I was starting to get worried. I was not worried I would drink, but I was worried about my emotional state. It seems the month before, my mood was more desolate. It might be a mix of a birthday, Robin William’s suicide, and other stresses. I was worried I would feel left out of most of the Burning Man fun or that my Burner friends would treat me odd. I decided to camp on my own from fear of staying with a camp with a bar. Then I was starting to get worried that camping on my on would be depressing and lonely. I was lucky and thankful that a week before the event, a friend invited me to camp with her and her friends. I think that was a saving factor of my week. I found Anonymous Village my first night there. I walked into the meeting tent. It was the middle of the night and empty. Seeing a couple of Big Books on a table made me feel comfortable. I thought “this is where my people are.” And I don’t just mean recovering alcoholics and addicts. I mean Burners that are in recovery. 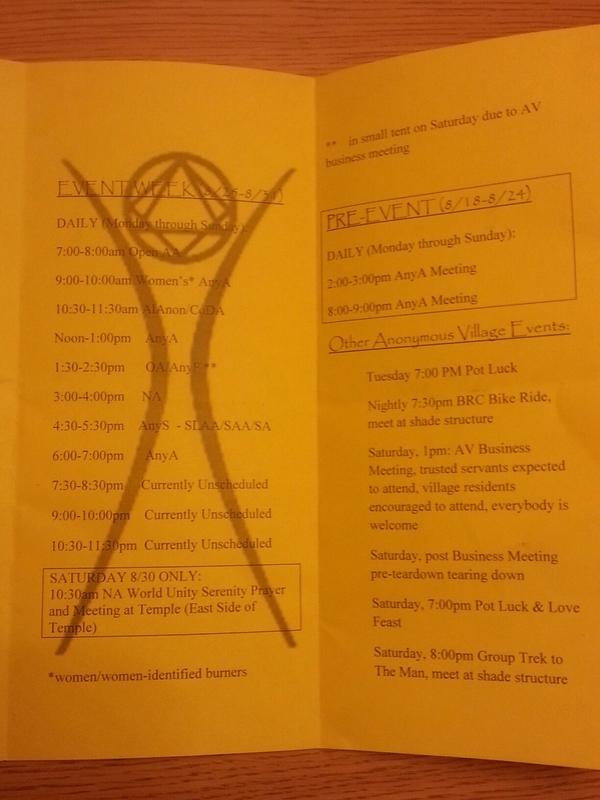 There were pamphlets with meeting schedules and it listed two other camps, Camp Stella and Run Free Camp, that had AA and other 12 step meetings throughout the week. I made a mental note to return the next morning for a meeting. I really wanted to meet other sober Burners and hear how they handle issues of recovery on the playa. The first Monday of Burning Man, the gates were closed due to rain. Driving on the wet roads would ruin them and since driving is prohibited when it rains, no one could drive in until the ground dried up. This made less people in the city. That lead to my first AA meeting on the playa having only 4 people. It wasn’t like the “default world” meetings where they read the 12 steps and promises and it feels the first 5-10 minutes are spent yapping about the same things. This felt more personal. We did a daily reflection reading and then just talked. I will admit I did not feel well connected to others because they have only been going to BM for a few years and they have been sober every since they started going. I felt I wanted to find someone who knows what is it like to spend almost every minute of Burning Man drunk and then come back and try to do it sober. I did check out another meeting at one of the other camps but did not really connect there either. It did feel nice to know that I was welcomed to hang out at any of the sober camps if I needed to. They all told me if the “craziness” of Black Rock City was too hectic, I was welcomed to come sit at their camps. I never did. Instead I spent a lot of alone time biking around and exploring the art. I took more photos of art this year than any other year. I also volunteered a lot. I always love to give back to the city. Burning Man is created and ran by volunteers. I have a few friends who go to party and have never volunteered. Most of them are “friends” are feel I am steering away from. I got to meet a lot of people during my volunteering shifts. I even spent an hour discussing addictions and mental issues with a supervisor that is a little up there in the Burning Man organization. We talked about our families and she poured out a lot. Then she thanked me. She said she doesn’t get to vent about it much. Watching drunk people do stupid things also helped me stay sober. I watched a drunk guy ride his bike right into another bike after the woman repeatedly said “watch out!” No one was hurt but you could tell she was mad at him. There were constant calls to medical and the rangers about people being drunk and passed out. (Unknown if other substances were involved.) And, unfortunately, a young woman died this year after being run over by an art car. It is unknown whether alcohol or drugs were involved. I kept thinking of the year I woke up in medical with an IV and was told I fell off an art car. That young woman could have been me. I did not see the Man burn this year. I slept all Saturday night. It felt great. I went to one more meeting my last day. It was a women’s meeting. I finally felt I connected. All except one have been to Burning Man in their drinking days and this was their first sober year. I enjoyed sharing stories of our experiences. I regret not getting phone numbers or email addresses. And I also got two gifts! Gifting is a huge part of the Burning Man community. A lot of camps make “schwag” or swag to give out. (Never heard of that term for marijuana until I read that oxford definition.) 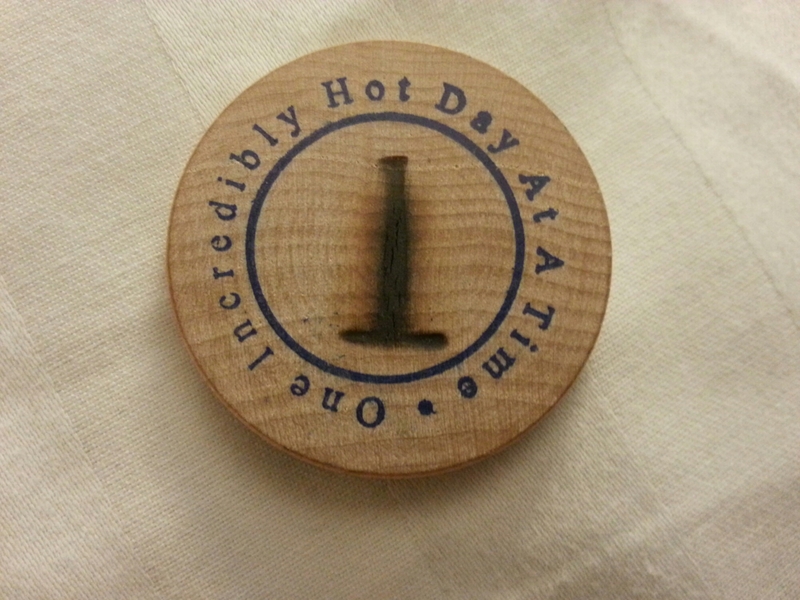 A lot make stickers, pins, necklaces, or other things with their camp name or logo. Well Anonymous Village gave me a sticker and two coins! 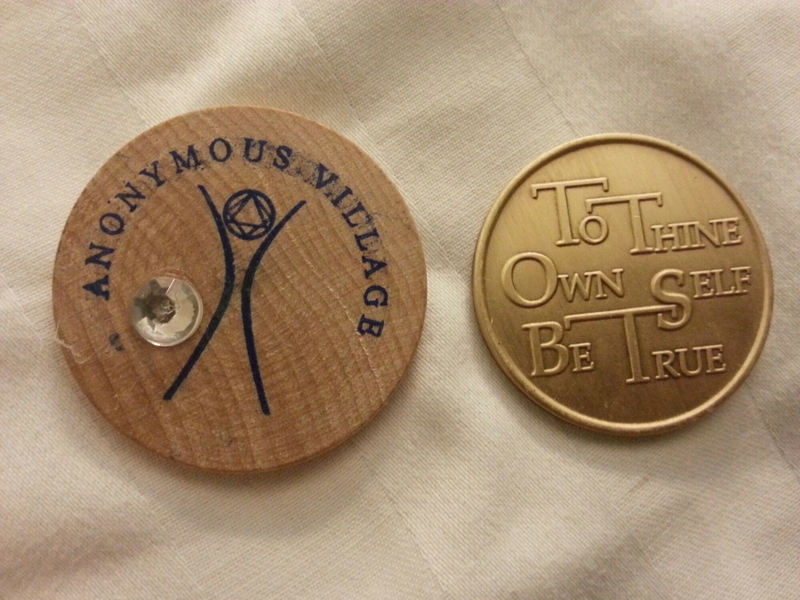 I got a token for my first sober burn and a “thine own self be true” coin. They were the best gifts I received all week. I thought of all those years I spent boozing at Burning Man. It seems so much of my week was spent drinking, planning my drinking and which bars to hit, or recovering from my drinking. I kept telling myself how Burning Man is so much better sober but I never really convinced myself that it was. Maybe next year, with more sobriety and tools, it will be better. Maybe next year I will camp with Anonymous Village. thanks for your post. I am happy to hear you had a good sober burn. And that you have written that you had more fun sober at burning man compared to times you went and drank. I have had a hard time wondering if it would still be enjoyable sober. Many of my friends are veteran burners who go every year and party the whole time so it has been very hard for me to identify putting myself there and staying sober. I think I made a good decision by changing my mind and not going this year as I’ve been a rough place emotionally. I also think its awesome you volunteered, I have been volunteering in general in my community and find great satisfaction in it. If i ever make it out to BM, I look forward to Volunteering in BRC. Btw love the BM chips, great shwag! Have a great day! Hey Meg, you might have made the right decision not to go yet this early in recovery since you have not been before, and especially if you have been emotional. It makes even the most emotional stable people turn upside down. But you can try to connect with other sober Burners if you are interested in going next year. http://www.burnanon.org/ I am even thinking of trying to host sober meetups at regionals. There are some Burners who will not “get” sober burning. I used to think the Anonymous Village was full of boring losers. Once, my camp set up next to them and we were pissed off that they asked us not to be loud late at night. They asked if we planned to have parties after midnight cause they couldn’t take anything to help them sleep. My selfish, alcoholic mind was mad they were trying to tell us “how to Burn” rather than be respectful. I remember I made fun of them for not knowing how to have fun. I always keep that in mind in case people do criticize me at Burns but so far, most people have been understanding. But don’t commit too many hours your first year. Maybe 1 or 2 2 hour shifts.